Our Thought's are Simple intelligent industrial innovation will lead to Reducing risk = Investing green = Reduced Fuel Burn = Reduced Cost = Extra Profit = Reduced Co2..! Reduced use of the main engine means reduced use of Lube oil. No ME Running hours Reduced use of the main engine means extended servicing schedules and lower maintenance costs. Reduced use of Bunkers means that the vessel can go longer between bunkering. This adds operational flexibility and reduces the likelihood that bunkers might have to be taken in smaller ports at high prices. is delivered directly into the hull as forward thrust. This makes it almost twice as useful as Engine power which is delivered asrotational force to the shaft. 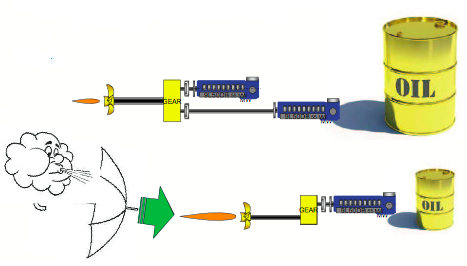 In effect, rotor power omits the 40-50% efficiency loss usually connected to the shaft/propeller and thus makes the vessel much more energy-efficient. Fixed price agreement can be made to give price certainty. These will simply be an agreement with the charterer to settle the power at a predetermined price for a predetermined period. There will therefore be no other parties and no mark-to-market requirement. The cashflow will match that of the other physical parts (TC hire, freight payment etc. ) of a long term contract. These tangible and valuable benefits mean that Rotor power is preferable to Main engine power whenever available. The benefits are achieved without any extra payment.